Thornham Marina and JBT Marine joined forces last Wednesday to enter a team in the Marine Industry Regatta. 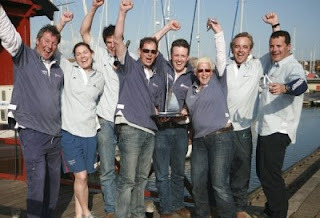 The report, results and photo's can be found on the Yachting Monthly website. Nick Gates & Co is located in a modern workshop based here at Thornham Marina in Chichester Harbour. 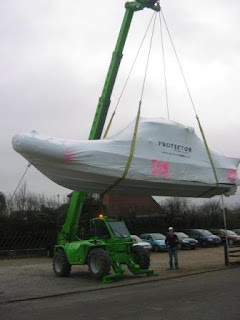 They specialise in the repair and restoration of wooden boats, including dinghies, yachts and motor boats, the insulated workshop allows them to do top quality work, whatever the weather. Nick Gates has restored his own boat Ocean Pearl, a 1933 fishing boat over a number of years. After she completed her working days 1960's she was brought down to London where she remainded until the late 1980's. That she is sailing today is a testiment to Nick's skill as a wooden boat builder and his dedication to the project. Below is a video of one of her first trips after the relaunch last year and also shows some of the work that has gone into this project. 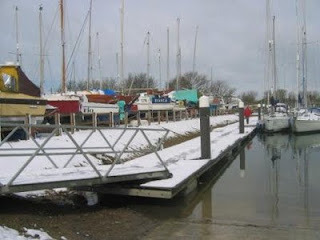 Here is a account from the yacht Moonbeam who was arriving onto her mooring at Thornham Marina, Emsworth for the summer in some unsually snowy conditions for the south cost. 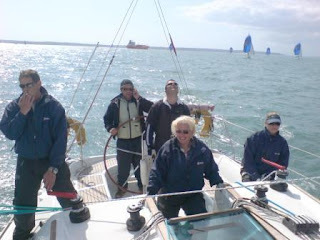 The journey was very interesting, we got to the end of the East Winner just when the snow & squalls came up the Solent. We could see it approach us at speed and just got ourselves wrapped up before we were in a whiteout. I had prepared a passage plan and we used the compass, GPS and chart to find the bar beacon. I then thought we could use reciprocal bearings between each mark to enter Chichester Harbour. However, the visibility was too bad and the sea very confused. The wind seemed to be holding back the tide significantly. The horizontal icicles on the shrouds were something I have never seen before and won’t forget. After a good time edging our way in with my brother monitoring the chart plotter we got to Hayling lifeboat station. At HISC the tide seemed have got over the “hump” and pushed us fast across the channel to Itchenor. After making the turn toward Itchenor conditions calmed down a little in wave terms, although the wind was still very strong across the front of East Head. Once in the Thorney channel we got the kettle on and enjoyed the view a bit except that the tide was lower than expected when I got to the turn (or what I thought was the turn) into Thornham Marina and we ran aground twice ! Still 2 boats out in the Eastern Solent/Portsmouth harbour entrance had to be rescued so my night school classes this winter were worthwhile. Its good to be back at Thornham and more interesting than Langstone Harbour or Southsea marina. Sounds like on this trip all the preperation paid off and shows that sometimes even on a short trip a good passage plan saves a lot of heartache. 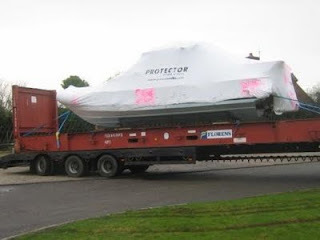 Earlier this year JBT Marine asked Thornham Marina to unload from road transport a 28ft Rayglass Protector rib that had been shipped from New Zealand. All this made for a large lorry load for our narrow lane. 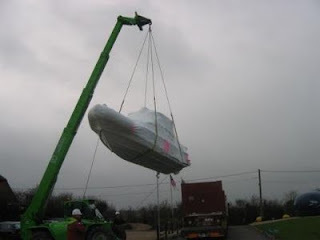 We at the Marina used our Merlo Telehandler to lift it from the transport. The Merlo with a 4ton capacity and a 17m reach is a new piece of equipment we had delivered last summer for unstepping masts and moving smaller boats although this is by far the biggest to date. There was an unsual occurence at Thornham Marina in Chichester Harbour the other day, not only did it snow, but it stayed for a while as well. We arrived at the marina late in the morning as the boats were getting ready to leave on the tide. This involved sweeping the snow off the decks, an unusual chore for sailors! Luckily the worst of the weather had gone through and the day had brightened. Below are some photo's we took. As all who go sailing, motorboating or even use RIB's know, weather and weather forecasting are very important. Thankfully due to modern technology we no longer have to set our alarms for the crack of dawn and listen in to Radio 4. This was normally followed by a stressfull hour drawing a weather map from the information given. All this while the crew are either snoring gently or stuffing bacon and eggs down their throat, depending on the time of the tide. That said my personal preference was to stay up an extra hour with a glass of wine and get the late night forcast. While the traditional method of gaining a weather forecast may still have a place when making longer passages, for most of us pottering around the coast or for the hop across to France, weather forecasts can be called up via the internet, mobile phones and PDA's whenever you wish. With the huge range of forecasts out there it is easy to find something to suit your needs, this may be simply the inshore waters forecast, or weather maps with predictions for the next 5 days or more. There are rainfall radar maps updated so regularly that you would know exactly when to put your waterproofs on! Now, some of this information is not available without an internet connection but many marinas now offer wireless access (it's on our list of things to do, honest! ), or there is always the local internet cafe. Even without these and often quite well out to sea, modern mobile phones can provide all the information required and more. Here are some of the weather sites we use at Thornham Marina for all to try, they are all free! Lets start with some of the better known ones, such as the MetOffice, chimet and her sister sites, that give actual and recent past weather information from stations around the solent area. The BBC site is another good site for inshore waters, shipping forecasts and surface pressure charts, similar to the Met Office. Beyond this there are sites such as xcweather or windguru which give spot forecasts for very localised areas such as Thorney Island in Chichester Harbour or Lee on Solent on the South Coast. A point to bear in mind is that these sites usually only give you the gradiant wind speed and direction and do not allow for local effects such as funneling or sea breezes which can make a marked difference to the forcast wind. meteox European rainfall RADAR allows you to watch the rain approaching and forecasts several hours ahead. Where there is rain there is going to be a wind change close by and it is also handy for knowing when to nip down to the marina and antifoul your boat. If that is not enough to keep you busy try Ant Veal's Great Weather which has enough links to keep anyone amused. After all that, remember knowing the weather is not only a safety concern but with a little practice and observation it can dramatically improve the sailing or boating experience for you and your family, this maybe by helping you to choose which weekend you spend on the water or plan a cruise so you don't spend the whole time fighting against the wind. If anyone has their own favourite sites please let us know as one of the great things about sailing is that some may know more than others but no one knows everything. The gale of the 10th of March at Thornham Marina kept us busy with the strong winds and a high tide making sure we were kept on our toes. All our yachts survived safely despite one leaving the mooring.